It is now clear that there is one set of rules for Republicans and the working man — And there is another set of rules for crooked Democrats and the elite class. In December Judge Emmet Sullivan abused and harassed General Michael Flynn in federal court. Sullivan even suggested General Flynn committed treason for his work with Turkey. This was a national embarrassment. It was reckless and abusive language from an unhinged judge. In October 2017 The Gateway Pundit reported that the Podesta Group somehow managed to file forms with the federal government retroactively that were 5 or more years overdue that Paul Manafort was charged for not filing. The Podestas were tipped off by the Deep State officials. Paul Manafort also filed his forms retroactively. Today Manafort sits in solitary confinement. General Flynn also did work with Turkey as did the Podesta brothers. General Flynn filed his forms retroactively. The Podesta brothers also filed their forms retroactively. Today Flynn is being accused of Treason — The Podestas are free men with all of their wealth intact. General Flynn worked for Trump. In December Attorney Jonathan Turley published a must-read opinion piece on FOX News. 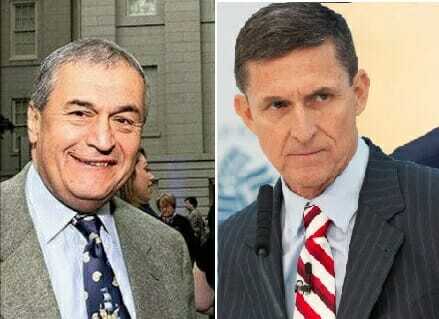 Turley revealed that Tony Podesta, John Podesta’s lobbyist brother, performed the same work as Flynn in the same country – Turkey. And Tony Podesta ALSO filed retroactive declarations as did Michael Flynn. Tony Podesta is a free man. This should be a lesson to every American. Do not stand up against the DC Democrat elites. You will be destroyed. The most worrisome statement by Judge Sullivan involved Flynn being a foreign agent as national security adviser. Flynn’s work as a lobbyist has been raised in the investigation, but this was work Flynn did before he became national security adviser in the White House and was unrelated to the Russia investigation. Yet the judge cited Flynn’s lobbying on behalf of Turkey as an aggravating factor he was considering in sentencing Flynn – despite the fact that this was not being used by the prosecutor as an aggravating factor. Flynn has never been accused of being a foreign agent as national security adviser. Flynn did retroactively declare that his work between August and November 2016 as a lobbyist “could be construed to have principally benefited the Republic of Turkey.” That work was not for Russia and such retroactive declarations are not uncommon. Indeed, various figures like Democratic powerhouse Tony Podesta (brother of Hillary Clinton campaign chair John Podesta) filed the same retroactive declaration under the Foreign Agents Registration Act involving the same underlying work for the same country. Violations under Foreign Agents Registration Act (until the Mueller investigation) were rarely prosecuted as criminal matters. The vast majority of cases were matters of simple filings and fee payments, or in a few cases civil penalties. The failure to file as a lobbyist for Turkey under the Foreign Agents Registration Act hardly makes Flynn the modern-day equivalent of Benedict Arnold. It makes him the Republican version of Tony Podesta, who is enjoying his retirement in his home in the upscale Kalomara neighborhood of Washington a few doors down from the former President Obama and his family.